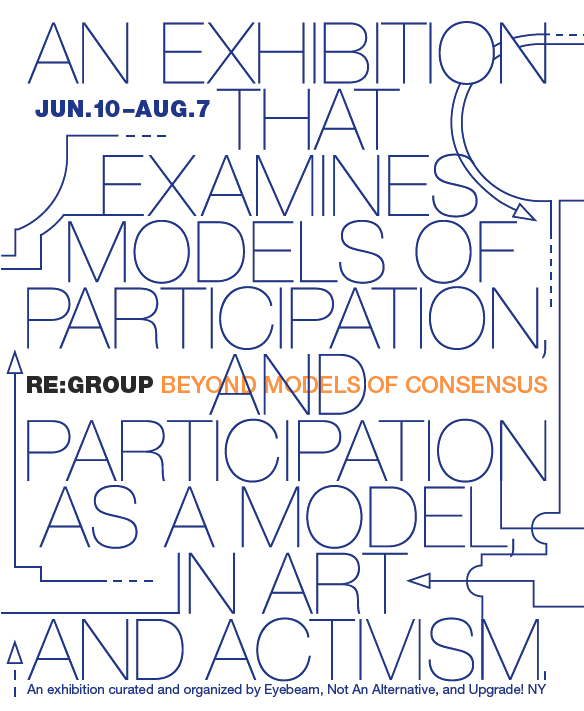 Works featured in Re:Group either incorporate or address participatory models in an attempt to expose their inner conflicts. Who profits the most out of gift economies? How long is the attention span of global solidarity? What are the economics of social capital? Will the tactics of over-identification win the war or just the battle? Does free software spell free speech or free beer or maybe just free labor? Can peer to peer technologies oppose centralized power structures or do they actually ensure the failure of unions to provide sustained resistance? And finally can we go beyond these binaries (the ‘or’s) and confront the multiplicity (the ‘and/or’s) that is network culture? From within this network of contradictions we have to emerge time and time again with new gain/loss analysis and to constantly reposition ourselves within each participatory context. So we can participate in unauthorized participation, sustain power through free association, collaborate beyond models of consensus… and later also tweet about it. If participatory frameworks are to have any meaningful political consequence or activist import, they must intervene on some object, to operate in service of an end. Conflict is a necessary result of such collaboration, and a key driving force within it. Current conversations around participation idealize harmony and unison, but we ask whether synthesizing perspectives and valorizing consensus might actually subsume dissenting viewpoints, through the tyranny of compromise and the rule of the lowest common denominator. From this view, we fear a disavowal of power rather than an honest discussion about it. And so we pass on politesse, and draw a line in the sand. 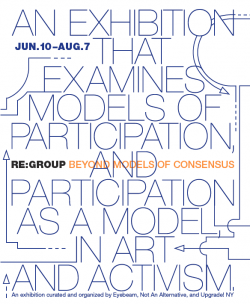 We aren’t interested in raising questions, exploring models of participation or experiments in collaboration. We take a position: that participationism plagues us. More than dismantling or distributing power, we’ve invisibilized and extended it. An intervention is in order, and we offer practices and programming that contribute to this conversation: foregrounding the contours and boundaries inherent in participation, the contradictions and conflicts in a fruitful collaboration. Now go read the whole statement. And visit the show, it’s up until the end of July with tons of events (which I will write more about later).